Dottybacks are members of the Pseudochromidae family, encompassing approximately 32 genera and 150 species. Dottybacks are a commonly kept aquarium species due to their outgoing personalities, relatively small size and vast array of colors and patterns. 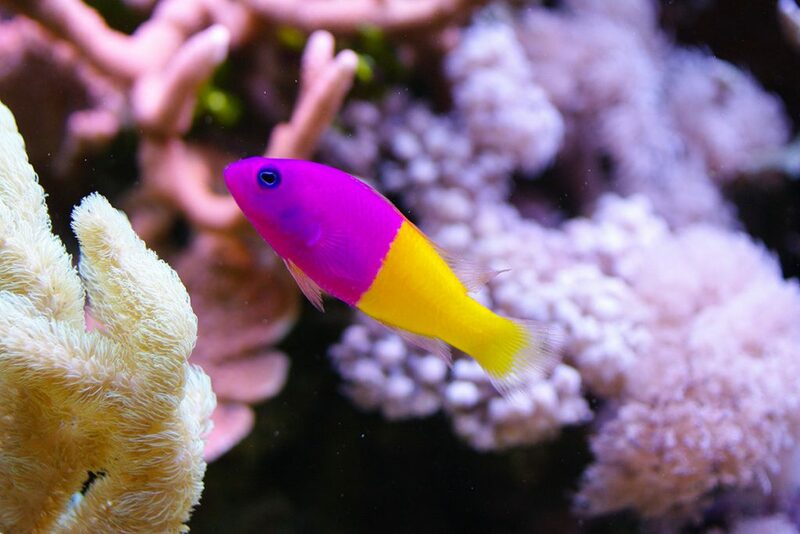 The Orchid Dottyback (Pseudochromis fridmani) is one of the most commonly sold dottyback species. Other commonly sold species include the Neon Dottyback (Pseudochromis aldabraensis), Yellow Dottyback (Psuedochromis fuscus) and Springers Dottyback (Pseudochromis springeri). Dottybacks are found in the tropical and subtropical reefs of the Indo Pacific. They can range in size from approximately 1” (2cm) to 18” (45cm), however most species average 4” (10cm) in length. Dottybacks are small, colorful, cave dwelling species that can be found from relatively shallow to moderate depths. They are omnivorous and are known to consume bristleworms. Dottybacks can make great aquarium inhabitant due to their small size, color and ease of care. Moreover, many species of dottybacks are now available as captive bred specimens. Dottybacks can exhibit aggression towards members of their own species, as well as any fish that look similar to them. Exercise caution when choosing tankmates for your dottyback. Dottybacks prefer a temperature range of 72F (22C) to 80F (26C). Dottybacks are generally considered reef safe, however they may pose a threat to very small, ornamental crustaceans. It is important to consider carefully what species of Dottyback may be best for your aquarium. While smaller species such as the Bicolor Dottyback (Pictichromis paccagnellae) are suited to tanks as small as 20 gallons. Larger species such as the Green Wolf Dottyback (Congrogadus subducens) may be better suited to a larger tank.